Beyond the nation-wide water splashing extravaganza, what actually happens during Songkran, Thailand’s New Year festivities? We explore traditions of this world-famous event, and understand the customs that capture the attention of the Kingdom (and the world) every from 13 April to 15 April. Traditionally, Songkran was the start of the new year for the territories of the ancient Khmer Empire, which include Cambodia, Laos, Myanmar and of course, Thailand. The name Songkran comes from Sanskrit, which means “Astrological Passage”. Indeed, 13 Aprils is the day when the sun moves into the constellation Aries, and is seen by the Thai people to symbolise renewal and change. All over the Kingdom, Thai people of all walks of life celebrate the arrival of the new year according to the solar calendar. The largest and grandest of the celebrations occur in Chiang Mai City, where festivities can last for an entire week. Agriculture is incredibly important in Thai society, so it’s easy to see the significance and symbolism of water during Songkran. It is the life-giving force of their annual harvests, and the Thai believe in its symbolism of purification before the new year. 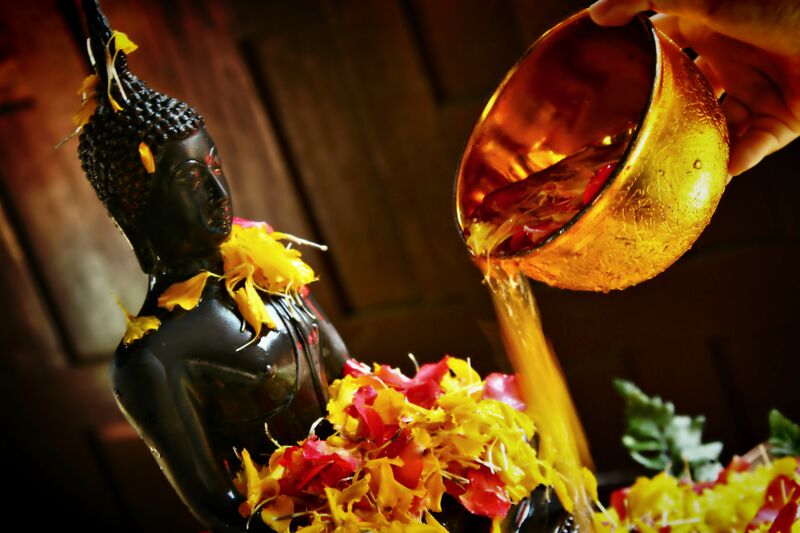 During Songkran, the Thai people sprinkle or pour scented water over Buddhist sculptures, monks, revered elders and even their parents as blessing. It is believed that these offerings of water, especially during the hottest and driest months of the year in April, is the sincerest sign of respect. Today, the gentle water sprinkling tradition that takes place within households and temples has evolved into a public event that takes lustral water to whole new heights (and depths). Think buckets of water, hoses and pump action water guns all over the streets. It’s characteristic of Thai culture to see everyone so wholeheartedly embrace this ‘modernisation’ of a traditional custom. While the water festival is certainly the highlight and icon of Songkran, elaborate processions and festivities are just as abundant. Thais throughout the Kingdom celebrate with great zeal, including carnivals, beauty contests, feasts and parades. Sculptures of the Buddha are taken out on procession, with the most elaborate and extravagant occurring in Chiang Mai. It is carried around the city to allow as many people as possible to receive its blessings, and pay their respects. It is then placed on an elevated pavilion, which receives sprinkles and douses of lustral water. At the same time, thousands of people will free birds and release fish into the rivers as a symbol of renewal and blessings. In some tambons (villages), a Nang Songkran (Queen of Songkran) is picked to reign over the festival. She leads the procession riding an animal figure based on the day of the week that Wan Songkran (Songkran Day) falls on. There are seven beasts in total, and in 2019, Wan Songkran falls on Saturday. The symbolic beast for 2019 is the peacock. If you get a chance, and aren’t washed away by all the water-dousing, do spend some time witnessing the traditional processions for the elaborate costumes, song, dance and sheer joy! Perhaps one of the oldest traditions of Songkran, the smearing of white chalk on the face is said to protect the wearer, and ward off evil as the new year arrives. It’s derived from the practice of Buddhist monks who use chalk to bless people, places and items. Combined with the water procession, it can become quite a messy affair. But the key is to take it all in stride. After all, the more chalk and water you have on you, the greater your blessings and your protection against evil. Predominantly practiced in Northern Thailand on the second day of Songkran, the building of Sand Chedi (Sand Shrines) commemorates the place where the Buddha’s ashes were kept. They are often built on temple grounds, where they range from the immensely elaborate to the endearingly humble. They are decorated with flags, candles, incense or flowers, and sprinkled with scented blessed water. This custom is also said to respect the sand and earth that cling onto the feet of devotees and monks within the holy temple grounds. 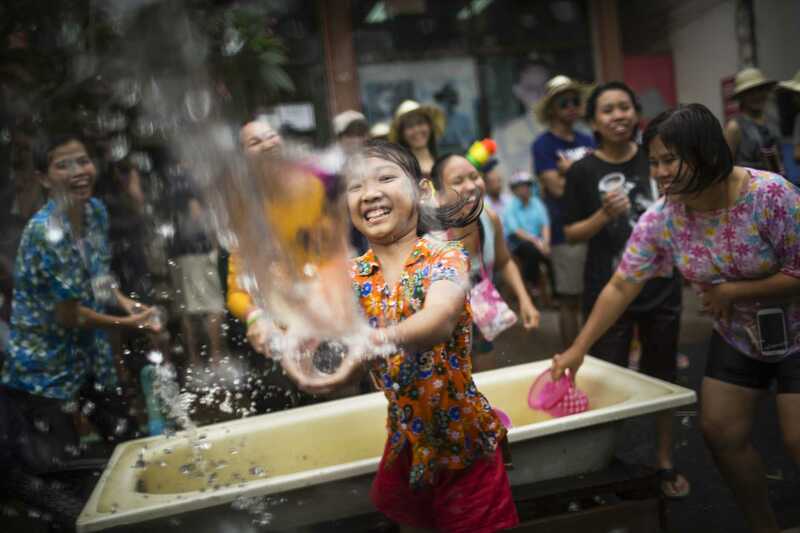 For centuries, Songkran has also been a time for courtship and romance. Since the ancient times, young men and women court each other through joyful and flirtatious courtship games. A game that has survived the centuries is Len Saba, or the tossing of indigenous Saba seeds. It’s a a simple game where boys and girls from different tambons (villages) take turns balancing and tossing a flat saba seed with just one foot to knock down the seed of a person of the opposite gender. It’s a highly popular and energetic game that brings together local communities during Songkran, and gives plenty of opportunities for young men and women to engage with each other in a playful manner. During Songkran, its highly likely you’ll see Thailand’s youth playing this traditional game, within the heart of Bangkok and the rural towns too. If you’re up for a festive time in the land of smiles, then you have to visit Thailand during Songkran! We hope this article gives you a little insight into the traditions and customs of Songkran, and you’ll join in the fun and spirit of the celebration along with the people of Thailand! ShopJJ is celebrating Songkran too, with 20% off selected brands that are authentically Thai and uniquely creative!